Unless you’ve made the decision to shoot food images solely in natural light, you’ll need to invest in some lighting equipment for food styling and photography. These lights can range from modest lights to high-end soft boxes (as shown in the following figure). You’ll need at least three lights with diffusers to serve as a main light, a filler light, and a back light. To make the most of your lights on a food photo shoot, you’ll also want to invest in some good reflectors and stands. 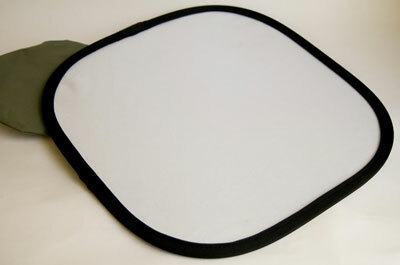 A multi-sided soft box light. Before you decide on a lighting setup, you need to make one basic decision: Which of the two types of photographic lights are you going to use — strobe lights or continuous lights? 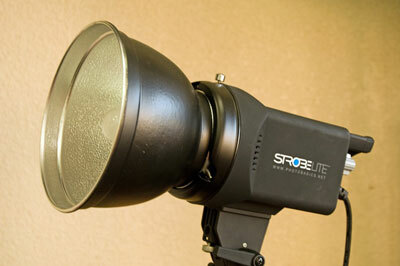 Strobe lights are essentially lights that function as a flash unit that’s tethered to your camera. Continuous lights stay on while you shoot (which is why they’re also known as hot lights). A lighting setup for food is typically one type or the other, not a mixed bag of both. Whichever type of light you go with, these lights need to be good and diffused to create a soft lighting environment to best show off your food subjects. In a typical lighting setup, you may choose to have one small light with a diffuser as the main light, one smaller (or farther away) diffused light as a filler light, and a tiny soft box shooting across the back acting as a gentle backlight. Reflectors are cardboard or nylon materials with reflective surfaces that help you manage the way light falls on your food subject. 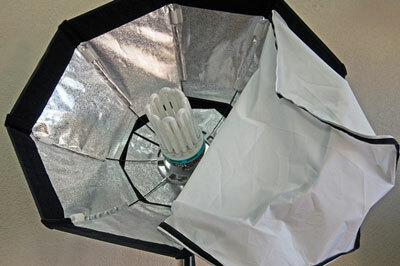 Reflectors are also helpful tools to diffuse and lighten unwanted shadows. Having a couple different reflectors handy on a shoot allows you to capture the highlights and shadows you need to make your images shine. You can use a light-colored reflector, such as white, silver, or gold, to add a bit of light to a food subject. And you can use a black reflector to tone down a too bright area in a subject. The dark reflectors are also great for coaxing out a little depth and shadow in a very light colored subject, such as whipped cream. To support some of these tools, you may want to consider buying a C-stand. A C-stand is a handy and versatile piece of equipment with an extending arm that can hold clamp-on lights, reflectors, diffusers, backgrounds, or whatever is needed at the moment. 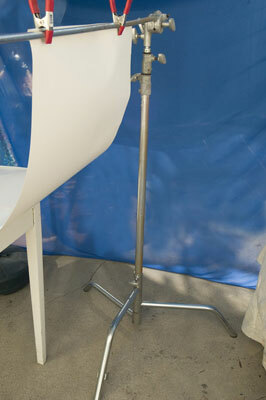 An alternative to a C-stand (at least for holding a reflector) may be an extendable reflector holder that can fit directly onto a light stand. Use a C-stand to support your lights, reflectors, and other photography tools.